Atlanta, Georgia is a city of contrasts. Sophisticated and simple, intense and laid back, satisfied and restless. Visiting there is like having to taste a hundred excellent dishes in one meal. Which is best? How do you decide? It’s better just to dive right in. Atlanta, the city, started as a railroad crossing in 1837. Transportation and commerce would forever define its economic success. Just prior to the Civil War, the city grew hard and fast mushrooming out of the Piedmont as a frontier town. All the vices and virtues of frontier living were alive and well in Atlanta at that time. The Civil War soon had an enduring impact on this rough and tumble place, changing it forever as General Sherman made his march to the Sea with the town smoldering in ruins. Only a few hundred buildings survived the devastation. Within five years, the town was rebuilt and the population doubled. Atlanta was on its way. Visiting today, you must explore the entire area in and out of The Perimeter to truly enjoy the city. Downtown. 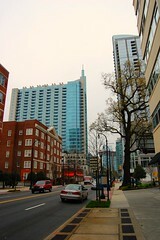 Midtown and Buckhead to Virginia Highland, Marietta and Alpharetta. Every area is different and charming in its own way. Driving around here is challenging and the good stuff is spread out but the MARTA public transportation system works well. I found staying in Midtown was an excellent blend of location, convenience and interest. Just remember that you can’t walk to everything you want to visit. If you want to see the best of the city, get to know the locals. So much is going on all the time in this corporate town that it rarely shows up in the usual information sources. Very impromptu gatherings. Talking to the locals gives you the skinny on food, drinks, art, music and happenings. Atlantans are proud of their town and are eager to show it off. Don’t be surprised if they ask you to pull up a chair and join them at dinner! Just make sure you order a Coke. Atlanta is a city filled with Southern hospitality, vibrant creative energy and strong local pride. Spend some time exploring every facet of this glittering gem from an insider’s perspective and you won’t regret it.